Douglas Scale Parts Washers are designed to quickly and efficiently clean detachable scale parts such as buckets, chutes and feeder pans. Specialized wash racks can be loaded at the weigh station and transported to the washer for easy cleaning. 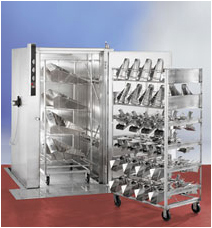 Racks are available for all brands and are designed to protect the parts during cleaning and extend their lifetime. For additional information on our entire product line, please call (800) 331-6870 or visit our web site at www.dougmac.com.